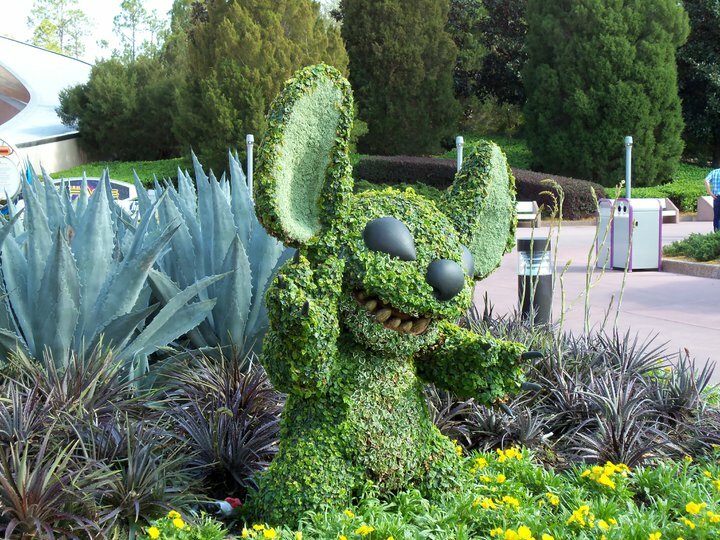 ComeSeeOrlando.com: Epcot's Flower & Garden Festival 2014 - In Full Bloom! 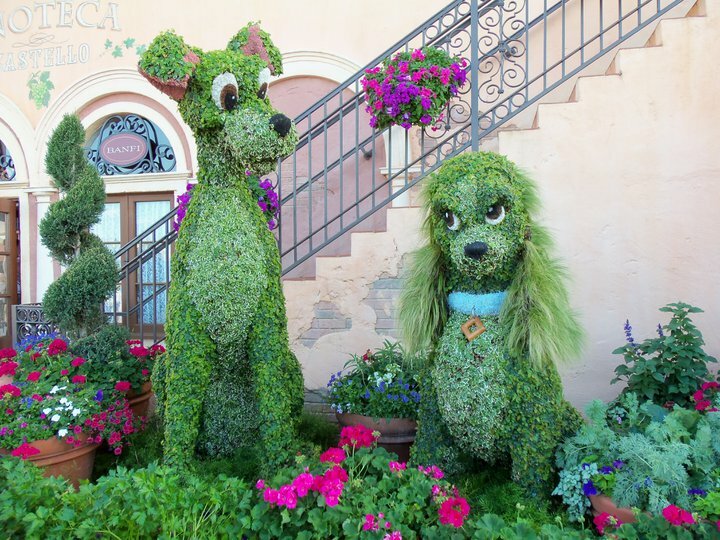 Epcot's Flower & Garden Festival 2014 - In Full Bloom! It's that time again, folks! The annual festival of Disney florals is once again upon us. 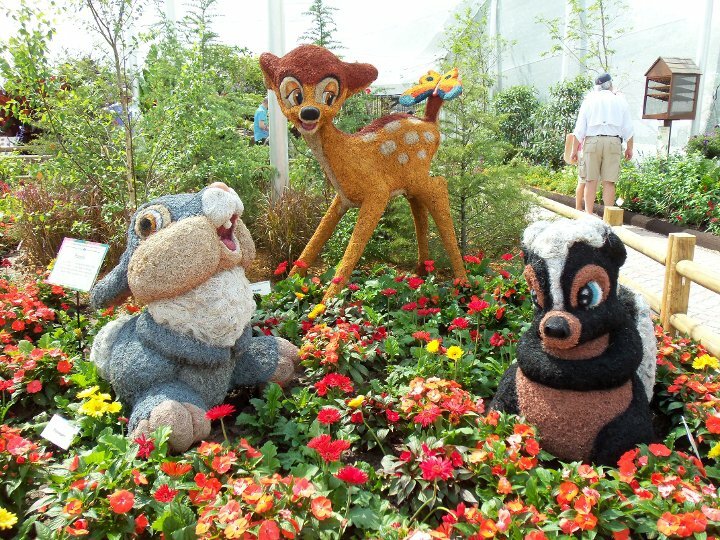 In celebration of the arrival of Spring, Epcot's Flower and Garden Festival is in full bloom. This year, the event runs daily from March 5 - May 18; and as always, it is included with standard park admission. This is the 21st year of the fanciful festival, and some notable changes have taken place! 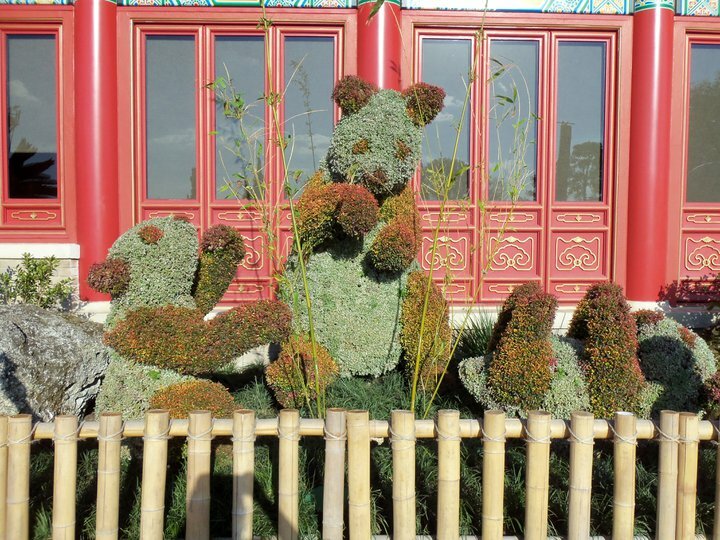 Although these topiaries are not new, the placement/theming is. Keeping with Orlando's newly embraced obsession, you can find Goofy and Donald playing soccer on the main walkway from Future World to World Showcase. Here, you'll also find a cute opportunity to get on the field between Goofy and the net for a photo op! A couple new faces made their debut this year, too! 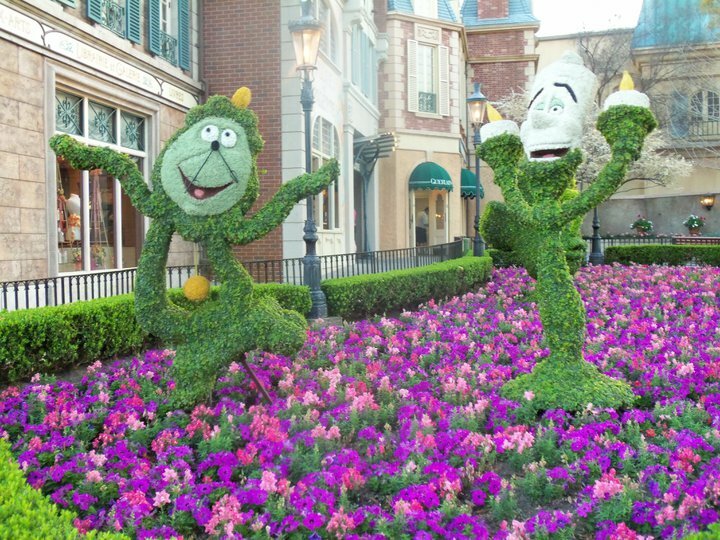 Welcome Kermit the Frog and Miss Piggy to Epcot! 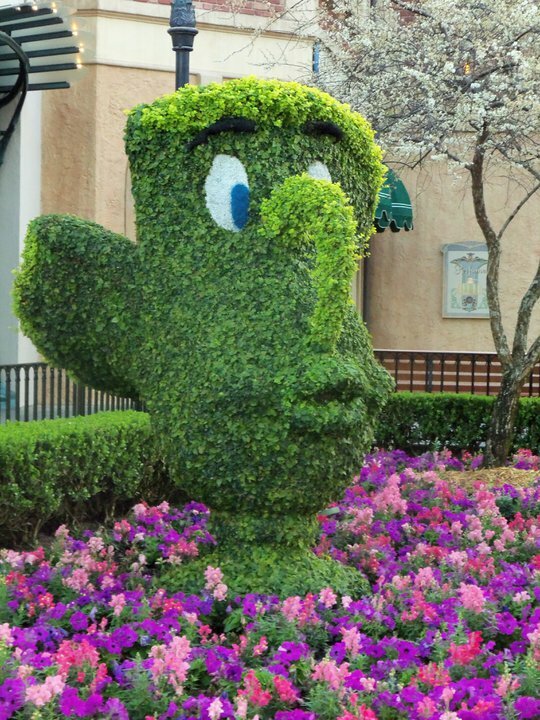 I have not included pictures of each topiary display, and before I get a flood of eagle-eyes pointing out perceived fraudulence... no, not all of these pictures are from the 2014 event. I've included a few pictures from last year as well. I visited briefly on Monday, and to the best of my recollection, the rest of these topiaries remained the same. I did notice that placement differed a bit from last year on some, including Bambi and friends and Tinkerbell to name a few. Some including Sorcerer Mickey and the broomsticks from Fantasia, and Sully and Mike from Monsters Inc. were loaners from other WDW parks. Come to think of it - Sorcerer Mickey really gets around! 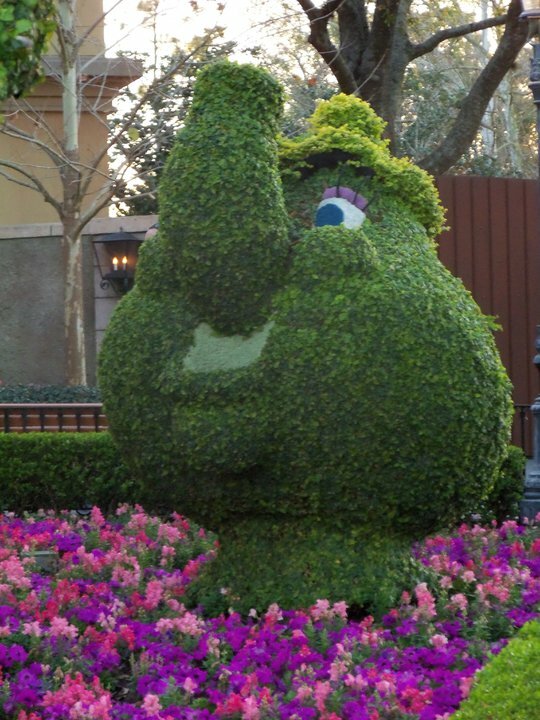 I've seen that topiary at Disney Studios and The Contemporary Resort! Hmmm...! One petty, ridiculous change that left me feeling unsettled... Timon used to hold a leaf with bugs on it. This year, his hand is bare. Now he just looks as if he is "presenting" Pumbaa, and I think this looks obnoxious. Okay, maybe it's just me on this one. 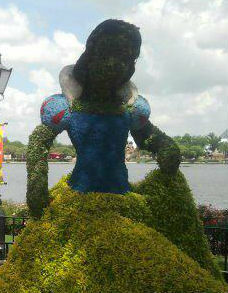 My personal favorite topiary display is Sleeping Beauty's Aurora and Phillip. The surroundings set the scene so perfectly. It really is a stunning tribute! Across the path from Sleeping Beauty, you will find Cinderella with her Prince. Even though I took these pics during the day, you can see in the bottom right corners that Cinderella's dress has under-lighting. It changes from blue to pink. Well, forgive my Disney nerdiness, but wouldn't that have been better suited to Aurora? If you've seen Sleeping Beauty, you know what I am referencing. I can't help but be a bit confused by all of this. Epcot festivals always feature a treasure trove of education, knowledge, fun and air conditioning inside the Festival Center. (Longtime visitors may remember this as the building that housed Body Wars.) The Festival Center is located between Mission: Space and Universe of Energy in Future World. Within the Festival Center, you'll find demonstrations, presentations, shopping, and more. HGTV is sponsoring this year's event, and they bring with them the stars of the HGTV and DIY Networks! Disney offers a complete schedule of guest appearances here. AND... the learning opportunities don't end there! Maybe you're like my grandmother, an avid gardener. Perhaps you're a walking curse to plant life, like me. Either way, you can appreciate the displays peppered throughout the park... container gardens, examples of modern irrigation, conservation tips, backyard wildlife garden arrangements. Soak up the tips and tricks of the pros, while you appreciate the aesthetic walk-throughs. 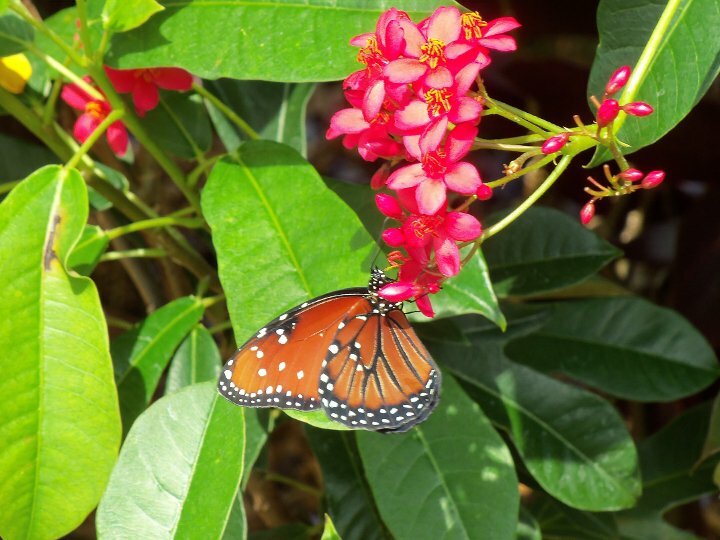 Guests of all ages will simply adore the butterfly garden! This used to be hosted by Bambi and his forest pals. This year, Tink took over! 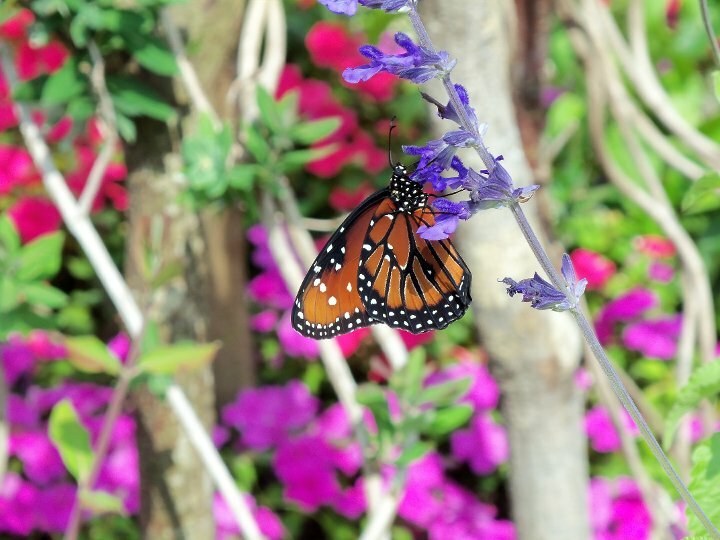 The butterfly garden also features tips on creating your own home garden to attract the fluttery wonders your way. Coolest thing, by far though... make sure you check out the cocoon stages on display. 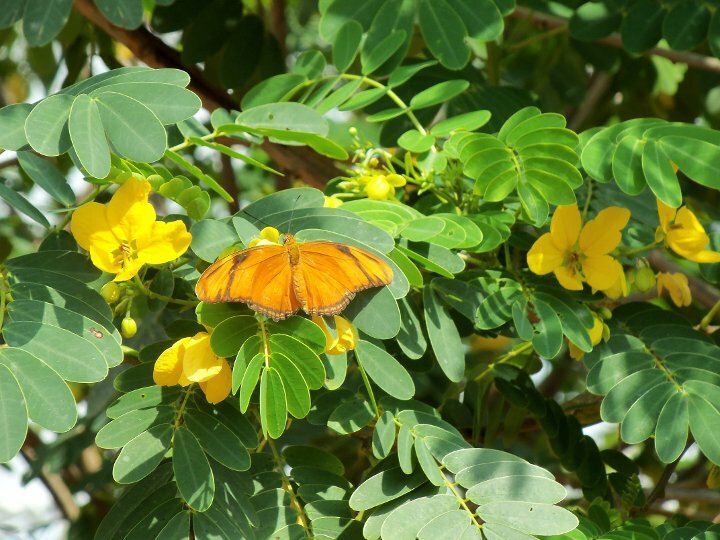 We saw a very freshly "hatched" butterfly, still unable to fly, on our last visit. These are quite cool to stop and gawk at, and there are a few of them around. Another feature I'm partial to is the English Tea Garden in the United Kingdom Pavilion. It is so so tastefully done, gorgeous, and it smells amaaaazing!! Take a stroll through here at the right time for a musical performance by British Revolution as well! I have to admit, as I've been sitting here writing this up, it only now hit me just how much there is to say about the Flower and Garden Festival. This is all before even beginning to discuss the other big addition in 2014 - FOOD. The Food and Wine Festival selections are so exceedingly popular that they have essentially chosen to bring it into Flower and Garden too! That's right... the food is everywhere, and it is irresistibly good! Problem is, there is so much of it! In fairness, it takes a day to check out all of the edibles. Mind you, on my Monday visit, I spent about four hours with a teen who was very anxious to do anything other than eat. This demands a return visit... and promptly! I did partake in the Pineapple Soft Serve with Parrot Bay Rum at the Pineapple Promenade (and I highly recommend it!! ), but I cannot fairly report on something I only smelled. I will attest to the pleasant nature of those smells, however, and use this as a grand excuse for a Flower and Garden sequel blog. So stay tuned for food and merchandise from Flower and Garden. I absolutely intend to devour a Piggylicious, by the way! Schedule of performers at the Flower Power Concert Series - an event included in the Flower and Garden Festival! Great blog post Dawn. I was just there about a month ago. I miss it already.